Advanced planning after College requires a proactive approach. Thinking about your future is not wasted time for anyone. Scott and Andrew discuss some ideas and techniques you can utilize now to make a difference in your career future. Whenever your education ends, prepare for it now. Employment Types during and after college to consider. What should I do with LinkedIn? How should I approach the people I want to network with? 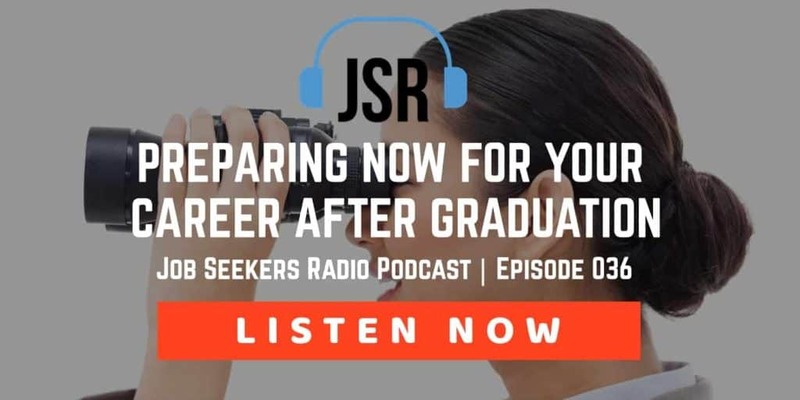 Whether you’re working or not today or jobseekers radio were talking about how to prepare for college graduation after college that is or any graduation experience I suppose it would do I do now we are our prior episode we talked about the choices that we might make him miss sort of relate to that address I think I have a career path what they want to do take the first steps or maybe there’s just too many step to choose from but how do I make these kinds of decisions and there are probably many different ideas on how to address this and there are people you can talk to which is what we recognize that the people listening to this may be they have obligations to prepare for and all those things the responsibilities of having timer margin to actually participate in these activities is really important Because that’s really not a strategy know it is but it’s not even a plan but it’s when a lot of us do we think we know what we’re going to do and we just wait till the moment to stroke and we jump and we realize we’re not landing where we thought we would so there are a whole lot of things that we can do to prepare for that graduation whether that graduation is finishing a training program and jumping into her career it could be could be within a company it could be the actual universe whatever that looks like the idea is getting out into the world before you graduate and finding out about the specifics about this one of the first things that people talk about his internship there are a number of internships out there seller paid and that something you’re going to want to consider if you’re in a situation where you need an income and unpaid internship may be an option We have written people from hiring unpaid interns in a lot of states where you’re at but you may be able to get a paid internship most of the time it didn’t used to be that way that’s great but the other thing to consider is full-time employment is it you may be in school now can you maybe be able to get full-time employment at your intended target company there’s also ideas that you may be able to get on campus employment if you haven’t explored that already you get to work in your industry at least on the academic side of your industry before you get out into the real world these are all good are all the same responsibilities and deliverables that you’re going to need in the outside world I would recommend doing as much as your time and ability people can really drive them full-time job or part-time job and went to Just their academic career started driving again whatever your style is whatever works for you that’s what you should be doing got to start doing things that are going to lead you in the direction of this kind of networking for you also may identify handful of temporary agencies that interact with the companies you’re interested in working for or even in the industry that you’re interested in the Rabia agencies that specialize in those kind of industry so that’s something to think about or consider going through this process also if you know people who do contract work in the industry that that you would be interested able to help them in such a way that you start getting experience you want and there’s very little investment that you need to make and often don’t have to commit to long-term deliverable well it may not be Does this really work with her to conversations are having with the problems do I typically see in the marketplace that I might be able to salt so that I know OK I see where I fit for people coming out of college they don’t always see where do I fit I just don’t know getting in there and actually doing a internship or part-time job or even volunteering I see people volunteer pro bono penny on how much margin you have in your schedule Garth and that has led to something you bring that point up and I think about somebody that I spoke with fairly recently he’s very interested in social activism but social activist still get paid for their work in most cases it’s usually something that there is some kind of grassroots effort that is starting and people get involved because they’re passionate about it but she wants to do more of that but he needs to make money doing it so this is one of those things where the networking is really going to pay off in the long term For him what I think is been able to help him how does he probably is knowing what you’re passionate about and going out and doing the hard work of networking and identifying people and taking time out of your school schedule your work schedule and all these different things to actually do the hand to hand combat that his job search is a lot easier when you’re chasing something if you’re the type to read and use for example or certain publications where they’re talking about the things that you do get passionate about it you’re considering for a career they are usually in the stories going to mention organizations that are active in it that’s a good starting point to do research on the companies that are doing it doesn’t have to be a capitalist organization it could be us Research on them and find out who it is that’s making decisions who is getting out in the community how do you get a boat they will probably pick you up fairly quickly this is an opportunity for you to start making a list right of companies make a list of job titles keep track of postings that you’re seeing in the marketplace and people you admire whatever those sources are compile them somewhere so you can actually address it look at it make some decisions kind of map out what the post graduation experience yet like for you so that you hit the ground running when you’re done great idea because now you’re going to be able to see where a lot of these dots connect anyway and you wouldn’t know that just by getting involved in a single volunteer activity by doing that kind of research and see who is connected to home and how do use interrelate you’re going to walk in now with more knowledge than you had if all you were relying on was the class that you took and College projects some of the volunteering stuff you’re doing on campus if you’re doing work-study talk about the work-study program start documenting some of the stuff so that when you get to the point that you want to share that with other people then you have it you have it somewhere Lincoln is also a good resource as a search engine so if you’re trying to add to your list of companies or people or did you research as we talked about LinkedIn is it exceptional database of information that you can take it vantage of even while you’re in school right especially while you’re in school the topic of connecting with people and we discussed another podcast but very useful in this context the idea is you don’t just send a request to connect if you don’t have a message on that a lot of people said we won’t spend the time they don’t already know you were up at least that day remember having met you in some fashion big gray may not respond at all Link in a request to explain why you’re asking them make sure that it’s obvious you put some thought into this and ask them for information or advice this is something that whatever reason you’re looking for work as you’re working your network if you have a job they generally but if you ask him for information or advice about your area of interest many people if they don’t have specific information so here is your opportunity to find people whether it’s in the news or somewhere else that they seem to be dialed into what you want to do ask them to connect but tell them why working on and then ask them for information and advice and the chances are pretty good you’ll get a response absolutely links in the show notes that go over all those topics including a series that we done on the anatomy of it For you to download on the website just go to jobseekers radio.com you’ll see plenty of links there to access that information the moral of that story is there’s always somebody to talk to absolutely we can either stay in a little bubble of school party in learning whatever but we can also take a chance and reach out to people we don’t know even though it may be uncomfortable to have a conversation to learn something as Cleon I’m just looking to learn something and have fun at the fair is a lot to be sad about leaving your comfort zone and there are a whole bunch of quotes out there that that I’m not going to try to to reiterate but if getting out there is not your thing it’s not your style preference you would much rather stay reactive there’s nothing wrong with being reactive it’s just not going to work as quickly and if you’re about to graduate you probably don’t have the time you’re going to need to push yourself to reach out More easily or this is already something you practice and you get excited about good for you don’t beat yourself up over whatever position you’re in but do you get out there that the person who makes the first first movement on now there’s an open always someone out there that you could talk to whether that’s in your location somebody say in another country but who is really well-versed on it they will have something of interest to you so don’t hesitate to reach out I would suggest that if you’re young and you’re just coming out of college and you don’t have a lot of constraints that you should not put constraints on your search and a lot of times of course there’s things that come up we have to because of family I get all that so you may have negotiable negotiable constraints I get it but if you if you don’t don’t constrained anything OK until you know exactly what you want to do keep geography open be willing to relocate Your responsibilities talk to the people involved because you may not be as restricted as you think it could be in your head when you’re planning this thing out if I’m looking at the time horizon and I’ve got 18 months till graduation or even six months to graduation I’m keeping my field of vision open so that I’m considering jobs anywhere I’m considering most any title any company until I know exactly what it is I want you know it just brings up a point to me that what we’re dealing with his change management is that the primary concern when facing change is if there’s have a process you can go through Erik there are several there a whole bunch of different theories out there and the one that I’ve been working with most recently as a methodology on how to actually embrace and implement change but you go through a period of gaining awareness and then gaining desire to do it you need to work on your knowledge of whatever it is But as you’re working through this remember that you are constrained most by does internal roblox roblox roblox but generally keep us from taking our next step so that’s probably what we need and I’m sure there’s no lack of anxiety imagine money I’m thinking also student loan debt is it I’ve only got so much runway to find a job so the sooner you can make that decision without having to make a decision maybe to go back to school if you’re not proactive in this process that’s a really good point action is going to help you even if it’s not where you’re most comfortable whatever you do Waiting or you know somebody who is preparing for graduation would you just share this podcast with them we would like to open up their minds and help support their success. show notes and resources their only job seekers radio.com/03 while you’re there we have a free gift for you of anatomy of a networking conversation is an e-book and I’ll walk you through the steps required to have successful networking interaction in the marketplace and we love to have you help others with that as well you got it when you have a chance if you would hop on over to iTunes this is where all of the rate and review infrastructure is really important to the success of our podcast and I think if you gotten value from those I would hope your rate and review would help someone else see the value as well and if you have some feedback on what we could do that but I will help you Morgan is that information to it we love answering questions that we like getting the screen back so. They’ll take you right to the page where you can thanks everybody for joining us next time start where you are with what you got right now.